The latest trailer for The Conjuring 2: The Enfield Poltergeist has arrived fresh from WonderCon. Director James Wan brings this supernatural thriller to the screen with another real case from the files of renowned demonologists Ed and Lorraine Warren. Reprising their roles, Oscar nominee Vera Farmiga and Patrick Wilson star as Lorraine and Ed Warren, who, in one of their most terrifying paranormal investigations, travel to north London to help a single mother raising four children alone in a house plagued by malicious spirits. 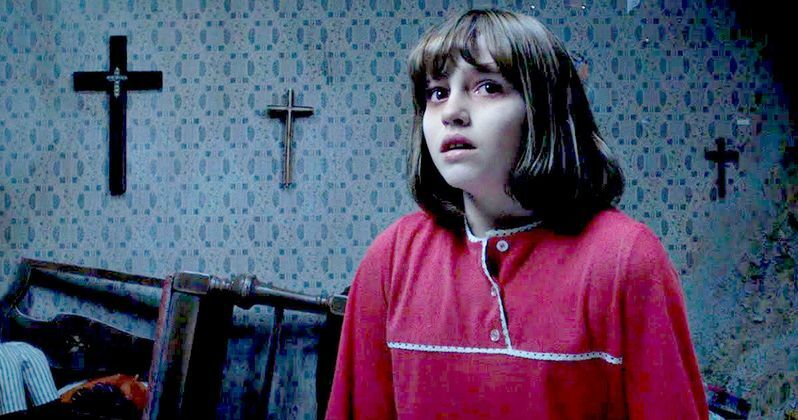 The Conjuring 2 is based on one of Ed Warren (Patrick Wilson) and Lorraine Warren's (Vera Farmiga) most famous cases, the 1977 haunting experienced by Peggy Hodgson (Frances O'Connor) and her family (Madison Wolfe, Lauren Esposito, Patrick McAuley and Benjamin Haigh). The paranormal activity took place between the years 1977 and 1979, at the Hodgson house in Brimsdown, Enfield, England. Some have claimed the haunting was real, while others believe it's fake, but director James Wan revealed that the case is among the most famous in history. Vera Farmiga and Patrick Wilson reprise their roles as Lorraine and Ed Warren from the 2013 thriller The Conjuring, based on their actual cases as paranormal investigators. Production started in Los Angeles this past fall before shifting to London in the winter. Shooting was only allowed to start after an actual priest arriving to bless the set. The supporting cast includes Frances O'Connor, Shannon Kook-Chun, Jennifer Collins, Madison Wolfe, Maria Doyle Kennedy, Simon Delaney and Franka Potente. The Conjuring: The Enfield Poltergeist is coming June 10, 2016. The thriller will go up against Universal's Warcraft and Lionsgate's Now You See Me 2 this summer. Last year, a report surfaced that revealed this horror sequel may also be connected to another famous haunting case, The Amityville Horror, which is mentioned in this latest trailer. 20 days after the Lutz family fled, Ed Warren and Lorraine Warren conducted an investigation of the house.The Amityville killings took place in 1974, three years before the Enfield haunting, and both cases occurred in different parts of the world, with the Amityville case happening in Long Island, New York, and the Enfield Poltergeist haunting taking place in England. Since the Warren's did investigate both cases in real life, it's possible there could be a connection. James Wan directs from a script by The Conjuring writers Chad Hayes and Carey Hayes. You can check out the latest terrifying footage, which finds a young girl being possessed by an old man. Get your hands ready to cover your face, this might just be too scary for you to watch!